Circus Salai – Review. West Park, Goole, July 2018. 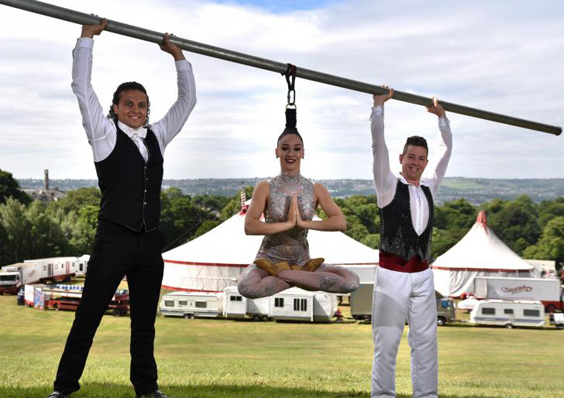 The Big Top comes to E Yorks. For many people, the circus conjures up images of tiger taming and cheesy clowns, but the art form has come along way since its birth – 250 years ago. Circus Sallai (pronounced Shall-ay) break the mould with a modern twist on the traditional art form, creating a family-friendly show like no other. Host and ringmistress Angel Sallai presents the two-hour show, which was created to celebrate 250 years of the circus. Though only joining forces in March, Sallai has notched up an army of fans on social media and, after their current stint at Goole, will be taking their show to Hull, before touring Lincolnshire. The multi-skilled ensemble is made up of acrobats, aerial performers, jugglers, clowns, magicians and stunt riders ranging from six to 70-years-old. Talented as individuals, these guys are, en masse, a formidable and entertaining supergroup. From the start, Sallai makes its intentions clear – encouraging its audience to ‘let imaginations run free and let dreams become reality’. And while my dream of running away to join the circus was put to bed a long time ago (turns out biscuit eating isn’t a real talent), for one girl that dream really did become a reality. Gymnast Hannah Kennedy ‘ran away’ to join the Sallai a few months ago and, after seeing her death-defying aerial performance, it’s clear this girl is going places. Hannah wasn’t the only performer to take to the Big Top skies. Opening the show with a unique aerial act, Stefanie Usher had crowds on the edge of their seats in awe as she dangled various parts of her body from an umbrella, metres from the ground. But for me, the star of the show was Chloe Jane Walsh, never before have I seen an act so unusual and daring. Clipped to a rope hanging from a pole via a metal ring that is tied into her hair, Chloe appears as though she is floating. But while her performance seems effortless, it is clear that a lot of skill, strength and a high pain threshold is needed to pull off such a hair-raising feat. Between the main acts, Billy the clown kept audiences amused – even recruiting a guest assistant at one point. After joining a circus school to learn how to juggle, the former model and actor soon discovered he was a natural-born entertainer. Billy’s modern twist on traditional slapstick had children and adults alike in fits of laughter. The daredevil’s acts were equally as impressive as the others, a favourite of mine being his ‘cloudswinging’. Sallai do a brilliant job of pulling crowds into their world. But putting the show together is no mean feat. It takes 20 trucks and vans, 3 miles of electric cable, 1.2 miles of water pipes and connections and a crew of 50 people. And, with fan requests to take the show to new areas, it’ll be interesting to see what else Sallai has up their sleeves. 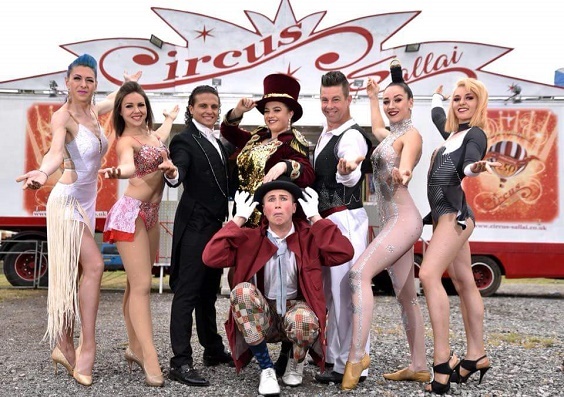 One Comment on "Circus Sallai – Review – West Park, Goole"
One of the best shows I’ve seen as far as a circus goes…I loved it and I don’t really go to these kinds of events much.